PDF Editor: Edit your PDF for free! PDF editors are popular tools because they allow editing PDF files mostly for free. Whether you use an Online PDF Editor or an installed version of a PDF Editor is a matter of taste. 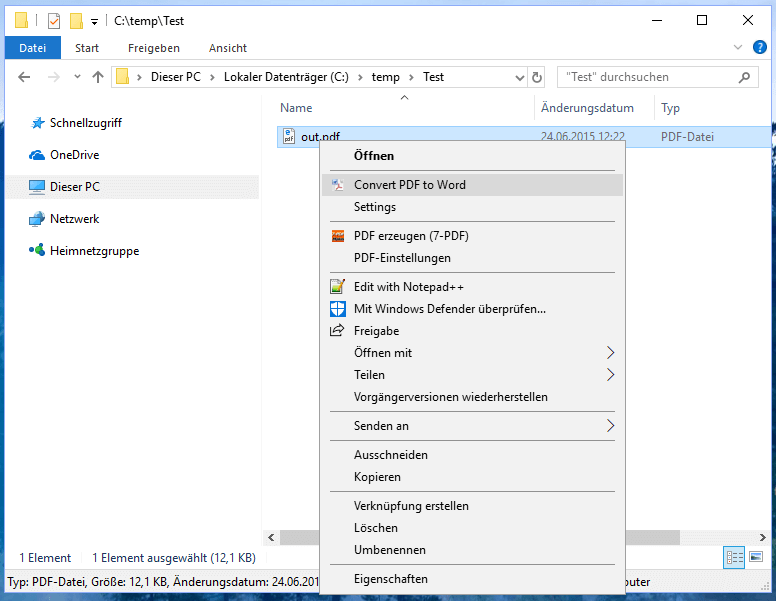 For those who are looking for a secure offline version of a PDF editor for the current Windows 10, we introduce here our self-developed PDF Editor. The PDF Editor can also be downloaded here for free! Edit PDF files but how? PDF files are actually immutable vectorized graphics files that you can not easily edit. However, we have created a way that allows them to edit PDF. We simply convert the invariable vectorized graphic format "PDF" into an editable format. Since many users already have a word processor installed on their system, be it LibreOffice, OpenOffice or Microsoft Word, converting PDF files into the editable Word format is a natural choice. In addition to Microsoft Word, the above-mentioned free text processing programs LibreOffice and OpenOffice also support this file format. 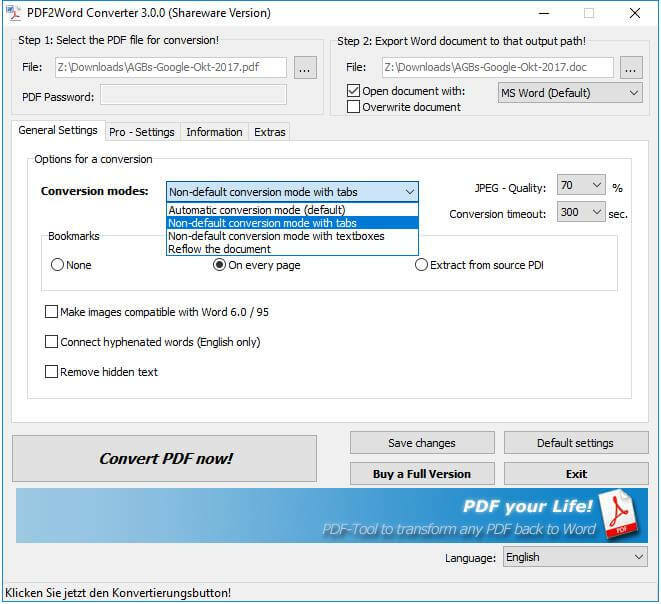 For converting PDF files, we have developed a PDF converter that transfers PDF content to Word format, preserving the layout of the PDF file (formatting, tables, texts, tables of contents, graphics, etc.). 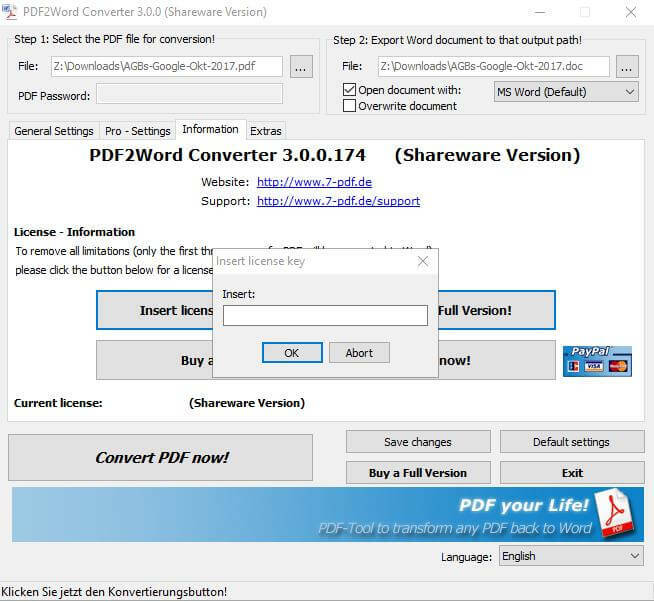 With the converted PDF file in the Word format, you can start after the conversion process directly in Word, LibreOffice or OpenOffice with editing the PDF content. The PDF editor is your advantageously and same word processing program that you use to write and edit your personal documents anyway. This circumstance, makes it easy for many users to edit PDF files, because a conversion or training period in a new, possibly complicated PDF Editor software is in this Procedure not necessary. Just use Word, Libre- or OpenOffice! This is also possible: Call PDF Editor directly from Windows Explorer! The editing of PDF files can also be called directly from Windows Explorer. If you click on one or more PDF files with the right mouse button, you can start after the conversion of the PDF file with the subsequent editing. As PDF Editor easy Microsoft Word offers many advantages! If you have converted the previously existing as a PDF document in Word or your favorite word processor, you have many options from this moment to be able to change the entire content of the PDF file. Whether you've been looking for a PDF editor that gives you the ability to extract pages or add pages, you can basically do it all with Word! Editing the author or the title of a PDF file is also possible because in Word you can define new document properties or change existing ones. With Word & Co. as PDF Editor you have all the possibilities to edit and modify the PDF content in full! From the editor Word simply convert it back to PDF! When you're done editing your PDF content, it's easy to convert your word file back to PDF. 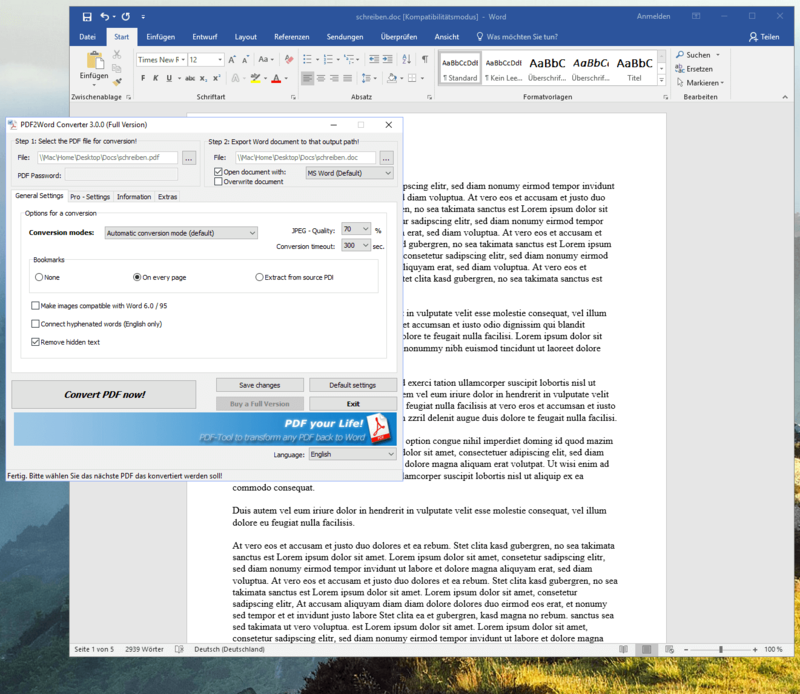 Newer versions of Word already support saving the content directly into a PDF file. LibreOffice or OpenOffice offer even a direct conversion to PDF format. If you need additional functions, such as inserting a PDF background or a PDF letter paper into the newly edited PDF, please download our PDF Printer. Our PDF Printer "7-PDF Printer" offers professional possibilities to create PDF documents from the print dialog as they need it. Whether you want to add a background to the new PDF that was previously edited in Word or want to include a watermark, our PDF printer complements our PDF editor perfectly. The Community Edition of the PDF printer is even available as freeware and certainly worth a try! 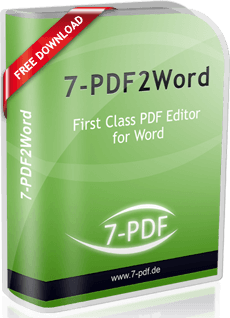 You can download and install the free shareware version of our PDF Editor "7-PDF2Word" from our website. The software converts the first three pages of a PDF document to Word for free. 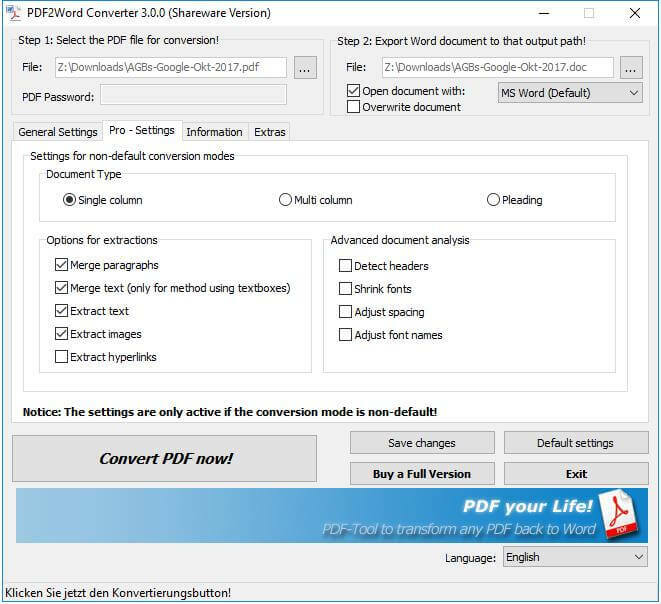 If you want to convert more extensive PDF files with our PDF Editor to Word, we recommend the full version of the program. The full version costs an affordable, one-time license fee (no subscription) and can be used for lifetime, that means future new program versions can always be unlocked and used as a full version with their once purchased license key.